This column inaugurates a series of columns covering the boating lifestyle and pleasurable activities. Capt. Nicole is a USCG-licensed captain, longtime boater and Paris Cordon Bleu graduate. 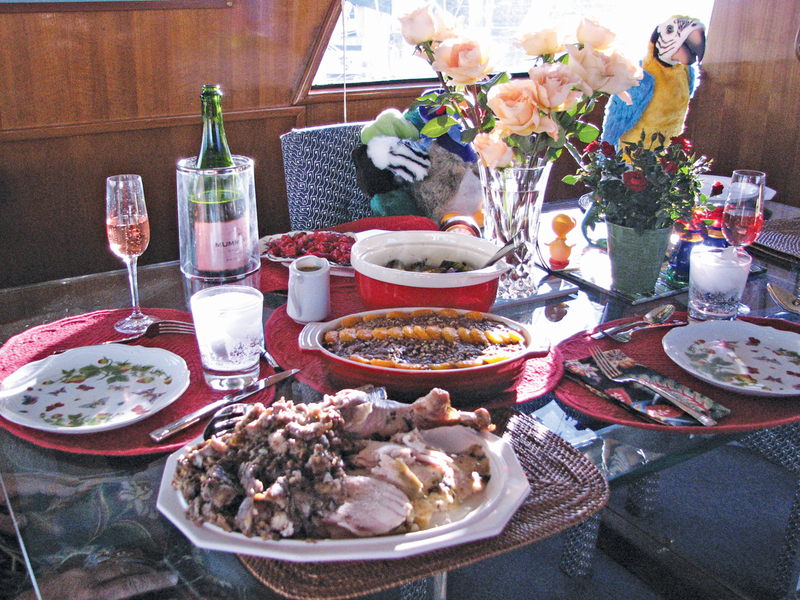 For most of us, entertaining on our boats is a casual affair, usually involving easily prepared or purchased food and drinks. I also enjoy having guests for dinner, which sometimes proves challenging. While I’m fortunate to have a well-designed and equipped galley — one of the reasons my husband, Arv, and I chose our boat — many of the lessons I’ve learned entertaining onboard readily apply to other situations, on both land and water. Most important, no matter how good or extensive your appliances and culinary tools, you can’t always rely on their operation. Be flexible, prepare for glitches and always have a backup plan. Like most onboard systems, galley appliances suffer from the harsh marine environment, with corrosive sea air and vessel vibrations exacting a heavy toll. If I needed a reminder, last Thanksgiving reinforced it. With dinner guests invited, I planned a multcourse meal. My first problem arose when the dishwasher, my favorite indulgence, was the source of an elusive freshwater leak Arv had chased for weeks. The easy solution? A return to hand-dishwashing. What I hadn’t expected was the sudden failure Wednesday afternoon of my convection-microwave oven, as I was nuking sweet potatoes and dumping pumpkin and brown sugar into a bowl for pumpkin pies. When Arv couldn’t fix what turned out to be a corroded door switch, I packed my supplies for pies, appetizers, stuffing and side dishes into bags. I drove home, 20 minutes from the marina, returning four hours later with the prepared food. I repeated the trek early Thanksgiving Day, this time with the turkey in its roasting pan and stuffing set to bake separately. The real question was how to keep everything hot until dinnertime. We keep a variety of coolers and insulated bags available to transport food to and from the boat. I removed the turkey from the oven at 1:15 p.m. and packed it in a large, soft-sided insulated bag, further protected with heavy towels. I covered the stuffing casserole in foil, slipped it into a towel-lined insulated bag and loaded it into another soft-sided cooler. I reached the marina just as our guests arrived. When it was time to serve at 4 p.m., after I’d heated the sweet potatoes in the marina’s microwave, I unpacked the turkey and stuffing. Both were still piping hot. Cooking a turkey or ham onboard presents its own challenges. Before I cooked my first turkey in our new microwave-convection oven, I measured its inner dimensions and called the manufacturer to find out the maximum-size turkey the oven would accommodate. The customer service rep recommended no larger than a 13-pound bird. That worked well, but another year I upped the weight to 16 pounds. The turkey fit into the oven, but without sufficient air circulation it cooked unevenly. Remember, too, that most galley ovens and refrigerators are smaller than their in-home equivalents and can’t fit the same-size cookware. Measure before you buy — as I didn’t more than once. Always save space by buying items that nest and serve two or more functions. Onboard entertaining requires a flexible mind-set. Excellent specialized resources filled with useful tips are Kay Pastorius’ Cruising Cuisine and Carolyn Shearlock and Jan Irons’ The Boat Galley Cookbook, plus Shearlock’s informative blog TheBoatGalley.com. Entertaining aboard can sometimes be challenging, but it’s a worthwhile adventure.